New information keeps emerging about the attempts by State of Law (SLA) to have three parliamentary seat winners – two from Iraqiyya in Diyala and one from the Iraqi National Alliance (INA) – disqualified and their votes cancelled. The likely net effect of such an action would be a gain for State of Law of one to two seats and a similar loss for Iraqiyya, putting the two on an equal footing or even making State of Law the biggest bloc in parliament. The Sumaria television station is chasing these developments and keeps churning out useful information in its interviews with key players. Among them are Khalid al-Asadi of the Daawa, who has said that the rationale for seeking the cancellation of votes is that the 52 cases of post-election de-Baathification led to disqualifications as well as annulment of votes (as suspected earlier, this now seems confirmed and likely includes such prominent cases as Ibrahim al-Mutlak and probably Raad al-Bayati). In Asadi’s view, it is impossible to differentiate between the de-Baathifications and other cases of post-election exclusions, such as those now attempted with regard to the three seat winners. Abdallah al-Jibburi is sought excluded on the basis of a past conviction; Najm al-Harbi on the basis of an arrest warrant but not a conviction (which seems dubious and is protested by Iraqiyya since the constitution is unequivocal in its requirement of a sentence having actually been passed – mahkuman ‘alayhi); Furat al-Sharaa of INA has apparently been given the all clear from IHEC since he has produced evidence that he left the army before the relevant date. That part of Asadi’s argument, seen in isolation, is comprehensible in so far as the election law in its paragraph 6 on candidate requirements puts all these criteria – including de-Baathification, membership in the armed forces and legal conviction – on exactly the same footing. In other words, slashing the votes of the de-Baathified ones without doing the same for other post-election exclusions would seem contradictive, and the trouble is that IHEC has already accepted the exclusion of Harbi and Jibburi in principle (but without taking away their votes). But that is where the logic of Asadi’s arguments stops. He goes on to say, “the election law decrees that the votes of excluded candidates that don’t meet the requirements for candidacy be slashed”. But where exactly in the law is that? Or is it hidden in an IHEC regulation? All the election law appears to say is in article 14 (2005), that if a member of parliament loses his seat “for whatever reason” then he should be replaced by the next person on that list, which seems to explicitly acknowledge the idea of keeping the seat distribution between lists unaffected and hence not annul any votes at all. IHEC has already applied this to the case of the recently murdered Iraqiyya candidate in Nineveh, indicating it should apply generally also to the transitional period between the election date and the first meeting of parliament (since the term “for whatever reason” would otherwise be meaningless). Rather, the idea of “cancelling” votes – shatb and hadhf are the Arabic terms that are being used interchangeably – seems to originate with the de-Baathification committee, which included this demand when it started its post-election attack back in March. What this all goes back to is the failure of IHEC and the international community to stand up decisively against the theft of votes implied in post-election disqualifications – and a concomitant domino effect of ever bolder attacks on political enemies. Before the elections IHEC and the international community failed to stem the wave of politically motivated de-Baathification. After the elections, the first batch of 52 exclusions looked innocuous perhaps since the seat allocation was not affected, and IHEC danced along with the demand from the accountability and justice board that these votes be annulled. The 9 extra de-Baathifications caused concern even at the presidential level, but instead of uprooting the problem of politically motivated attacks, the stop-gap measure of a reinstatement by the special appeals board for de-Baathification was used. All this established dangerous precedents and legal contradictions, and it is in this legal haze that the SLA is now operating. An additional problem is that it is hard to see where this will end, since acceptance of the idea of post-election disqualification in theory opens up for a plethora of future attempts to use the court system to produce convictions of political enemies. What if a member of parliament of, say, an influential Islamist party, gets convicted in 2011 for a murder that took place in 2005? Should the seat distribution of parliament then be recalculated even in the middle of a parliamentary term? Meanwhile, there are worrisome signs that the international community is not paying sufficient attention. A sometimes-erratic webcast from USIP yesterday seemed to convey a message from Ad Melkert of UNAMI (the UN agency in Baghdad) that “the good news is that everything is being done according to the books”! Which books, one wonders? Rhapsodies on Islamic Democracy by A. Chalabi, A. Lami et al.? One Thousand and One Nights? For the relationship between the certification process of the Iraqi elections and the relevant constitutional and legal frameworks is in fact now looking increasingly fictional and only a decisive message from the international community against post-election disqualifications can save the situation. IHEC still has some leverage because the courts do not have the competence to recalculate the seats as per the SLA demand, and UNAMI and the international community have the opportunity to bring closure to this divisive issue by focusing on the idea of restoring votes to the relevant lists. Doing so for the 52 excluded cases would not change the seat distribution but would bring an end to the continuous wave of politically motivated attacks. As such it would be a far healthier solution than relying on the Iraqi courts, which risk becoming increasingly politicised over the coming week unless something is done to end this theatre. But at USIP yesterday, no one even mentioned the cases of Jibburi and Harbi even though they contain far more political dynamite than the previous 61 cases of post-election exclusion. This entry was posted on Friday, 28 May 2010 14:44 at 14:44	and is filed under Iraq's 2010 parliamentary election, Iraqi constitutional issues, Uncategorized. You can follow any responses to this entry through the RSS 2.0 feed. Both comments and pings are currently closed. Hi Reidar, you know my views, and although i despise the baathist, this is very worryng for me, because this could turn against everyone, today the Islamists are doing this, tomorrow it will be the nationalists etc. Has there been any time frames on when will they decide on these issues? Ali, the latest I heard was IHEC saying a decision would be made “within days”. That was just before the Iraqi weekend, so I guess Sunday would be the earliest. This whole vote-stealing process is just ridiculous, so much for American succes: a democratic Afghanistan were Karzai prints 900 thousand fake votes and a democratic Iraq where Maliki bans opposition candidates after the election to get votes subtracted from their lists so that he has more votes. This is exactly why these moves hit the political process, not the alleged baathists. If a negotiated agreement is reached after this then the precedence is set for anybody to exclude as they like. It is a sign of desperation and a Maliki position of “all or nothing”. The IHEC should know the consequences from the international community before announcing their decision. Yes Faisal I agree, I believe that there must be amendments to the constitution to make things a lot more clearer, maybe Reidar has a point in this regards. The next government should ensure the constitution makes it clear you cannot ban someone after the elections, and votes cannot be taken away. Also the constitution should make it much clearer in regards to the meaning of kutla. Of course, electoral districts deprives the heads of lists of their power and control inside the parliament, and hence few of the existing leaders have an interest in going forth with this process. When the parliamentarian KNOWS his districts, and more importantly, when the voter knows who represents his/her district in Parliament, there will be accountability and hence the parliamentarian has to work for his district and not for the head of his/her list. Of course, there is the issue of women quota to deal with. The relative lack of international reaction to this string of continuing outrages has been (and remains) appalling. ???? The boundaries of the electoral districts would be instantly gerrymandered by Chalabi, ISCI, Sadrists and co to ensure (a)a perpetual shia party majority, even super majority and (b) enable electoral fraud in the individual districts. All that would be needed then is to replace the prime minister with an elected president and Iraq would be back to the good old days – but with a shia dicatatorship hand in hand with Tehran. I think this is a bit of overreaction. It appears to me that Maliki wants to delay the election certification and so he has pushed for more disqualifications. It will eventually blow over like the other protests over the election. People seem to be going from the trees to the weeds and missing the forest of what is going on big picture with the parties. Also of a funny note Allawi has kept up his reputation since the election of not spending much time in Iraq. He was asked about this recently and told the questioner that he was just thanking the foreign governments for not interferring in Iraqi affairs! I have been calling for “UN Census and Elections in Iraq” or UNCEI since March 2006. I believe it is inevitable and the situation to bring it about is soon. Joel, another possible interpretation would be that the 52 initial cases of exclusion were perhaps the weeds. Very few personal votes and seat-winners that did not change the electoral divider. For some reason, those exclusions nevertheless created a lot of commotion in the Western press. The next nine ones were the trees: Seat-winners, partially with personal votes that affected the electoral divider, though not necessarily the seat distribution. But these three latest exclusions have personal votes that *exceed* the electoral divider, meaning changes to the seat distribution are inevitable if they are implemented according to the SLA demand, and making the lack of coverage of these cases in the Western press quite remarkable. To me this suggests a clear pattern of escalation with respect to the SLA involvement. I think it is worth keeping an eye on these issues, not least because just one more misstep from the judiciary will create facts on the ground from which it will be exceedingly difficult to retreat in a graceful manner and without damage to the whole post-2003 system of government in Iraq. The fact remains is that Iraq is a majority she3a, so the majority is she3a. What you seem to hint at is that the representation of She3a is the exclusive domain of She3a Islamic parties. This is not the case. It remains a fact that Allawi got more votes in the south than Maliki and co got in the center and the west. Further, once the MP’s are responsible directly to the voters in their districts, I do not care what Chalabi and company will do to try to keep them under control. The fact is, the top echelon will loose much of their powers. Eventually, there will be organzied parties with elections to choose the leadership that would then provide support for properly selected candidates to run in each of the districts, gerrymandered or not. If Gerrymandering is the end of democracy, it should have ended in the US a long time ago. In he end, if you mean that iraq will continue to be divided along sectarian lines, then pretty soon there will not be an Iraq to worry about. The only salvation for a “gerrymandered” country, such as Iraq, is for secularism to take root. Iraq was mostly secular in the 50’s and 60′ and 70′. It was Saddam who brought back tribalism and sectarianism. If Maliki gets away with ‘guilty until proven innocent”, then we are already back to Saddam days’. I am not interested in the relative innocence or guilt of the candidate that won in Dyala. I am more concerned with the rights which is inscribed in the constitution, that one is presumed innocent until proven guilty. Yet, here we have a situation where people are being disqualified based on accusations….. If there were districts, then a special election can be held in that district to select a replacement. Until such time, the list system is all you have to replace the disqualified candidates. To penalize the list by taking away the votes of “accused” people is just not fair. Maliki and company should be weary of using a weapon that could easily be used against them in the future!!!. There is really no long term thinking about building a state of law and order by the list which proclaims that they are all about law and order – ironic. I agree that this latest stunt is likely to prove a bridge too far, even if it should succeed in its immediate aims. First time have ever seen anybody arguing in favour of the gerrymander. Honestly. For weeks now this blog has been pre-occupied with the attempts of the two shia parties to overturn the results of the election. How much easier for them if they could ensure the results before a ballot was even cast. it is not an argument for Gerrymandering, it is a counter argument to keeping the closed list/open ist system. Your argument is based, in my humble opinion, on assuming that the Islamic parties have a monopoly on the representation of Iraiqs (be they she3a or sunna), and based on the transference of the american experience that dictates that incumbents always win. Your argument does not take into account that Iraqis experience and the situation in Iraq. As it stand for the last 7 years, The parliament of Iraq is controlled by 8 or 9 people, which makes it easier for Iran (or others) to pull the strings. You also appear to be unable to understand the value Iraqis have on their name and their “honor”. If we have defined districts and the people really know who they are voting for, then I can tell you that the MP’s will take the side of their constituents over the interest of the party leaders. If you are interested in real democracy in Iraq, then i suggest the only way to achieve that is to liberate the MP’s from the party influence. It would make for a difficult country to govern. But we either believe in democracy or we do not. If what we are doing here is to assure that a certain party wins (in your case the anti she3a Islamic parties, be they secular or sunni or even kurds), then we are not thinking of real democracy only in the “appearance” of democracy, ala iran fake vote. If that is the goal, then why bother with the whole excersize. Just install a mini Saddam and let us go back to the good old days. Had the she3a party known that the elections would be based on open lists, then then Maliki would have merged without insisting on having a 50% +1… he would have even accepted a 35 percent representation in the combined list. Not sure if INA would have let him in at that point if they knew it would be open list. Do you think that INA would let Da3qa get away with setting districts for themselves only. Further, in the south, and the west, family names still mean a lot. Too complicated to try to explain in blogs. Sometimes they say that INA & KA are the Closest to them. Other times they say the same thing about SLA. Can Iraqiya (with all the secular and antikurdish leaders in it) have a deal with the Kurds or Sadrists? You are mistaken, Maliki and Dawa were counting on the elections being open list and some within Dawa were trying their hardest to create as many stumbling blocks as possible to prevent a grand Shia coalition before the elections (and they succeeded) and they are the same people trying to prevent it now (Maliki being one of them). It was Dawa who argued strongly in favour of an open list and enlisted Sistani’s help in this. They believed that their candidates would come out on top in an open list compared to SCIRI and other groups – and they seem to have been right. Mostafa, I think there are two or possibly three trends within Iraqiyya on the coalition-forming issues. 1. Those who emphasise ideological similarities with SLA on questions of state structure, centralism and Kirkuk. I have seen comments from Taha al-Luhaybi and others from Hiwar and Hadba going in this direction. 2. Those who are worried about Maliki’s concentration of power and prefer the INA and the Kurds for that reason, even if it makes you wonder which is the greater threat to Iraq: Maliki’s centralisation of power, or the regionalist ideas of Masud Barzani and Ammar al-Hakim? Also, they apparenly refuse to see the contradiction of making an alliance with the very people that designed the de-Baathification revival in order to repolarise Iraqi politics along sectarian lines – the organising principle to which Iraqiyya is supposed to take exception. Having said that, Allawi enjoys good personal relations with Barzani and as we already see in Nineveh, Nujayfi rather than Maliki may be the person that can actually give Barzani some of what he wants there, so I wouldn’t rule out cooperation on the basis of the cliche that Hadba and KDP hate each other. a. Those who talk mainly to ISCI within INA, i.e. old friends of Adel Abd al-Mahdi and the Hakim family from the time of the governing council or even the days in opposition, disgrearding absolutely every reservation concerning ideology (especially the decentralisation and pro-Kurdish agenda of ISCI). b. Those who think positively about the Sadrists and hope they will eventually help sideline ISCI. This may make more sense from the point of view of theoretical state structure (i.e. the Sadrists being more centralist and slightly less prepared to give away Kirkuk), but it disregards the prominent role of Sadrists such as Bahaa al-Aaraji in whipping up the de-Baathification issue and sectarianism generally in the past months. Anon, that is an interesting interpretation. I guess everything here goes back to the spring of 2008, when the open-list concept was first inserted in the governorate elections law that was passed in its first iteration on 22 July. I certainly remember the Kurds and ISCI making all sort of pathetic and ingenuous excuses for keeping the closed list, including the claim that the illiteracy of the Iraqi population made the open list impossible and that it would be difficult to keep the female quota! But I wondered whether you could guide me to a pro open-list statement by some Daawa figures from before 22 July 2008. I am sure they may exist, since the draft after all made it through the government despite objections by ISCI and the Kurds, but I cannot remember having seen anything explicit from Daawa during that crucial period. If SLA were counting on an open list, why did they insist on having 50% +1 of the representation within the combined Sh3a list? The INA was willing to give them 48%, but that was not good enough for them because SLA wanted to guarantee the nomination of Maliki as the PM. If SLA was counting on an open list, then it would have been stupid to reject the offer of 48%. The same argument is useful to look at the INA. If they knew it was going to be an open list, then offering 48% just does not make sense if they want to get rid of Maliki. It was Sistani that pulled the rug from under the Islamic parties (and the Kurds as Reider indicated) when he indicated his preference for an open list. The INA and SLA could not possibly go against Sistani’s wishes since both of them proclaim they are “blessed” by him. Chalabi had his guns loaded on DeBaathification and did not shoot that gun until close to the elections because he knew well enough that if the election campaign was going to be about performance, then both SLA and INA were destined to failure. 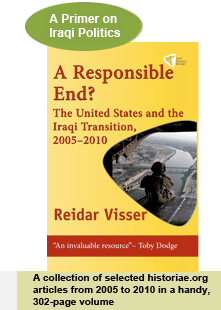 I do not share Rieder’s point of view that INA’s debathtifcation was intended to hurt SLA more than Iraqia. I think Chalabi’s biggest worry has always been Allawi…. they have a long history of dislike. The body language of the two in the meeting held in early may at Abdel Mahdi’s house speaks volumes as to the “love” these two hold for each other. Observer, just for the record, my theory has been that de-Baathification was designed to hit both Maliki and Allawi, by making them both look more sectarian than otherwise would have been the case. I think without de-Baathification Maliki would have done better north of Baghdad and Allawi would have done better in the south. What happens if these disqualifications are dropped or if they are allowed they still don’t change the election results just like the other objections? I’m not saying the whole disqualification mess isn’t important, I think it was a fiasco and a hijacking of the election campaign, but I think its just part of the brinkmanship to put together the new government and those negotiations are more important. Joel if these disqualifications are allowed in the way SLA asks for (on the precedent of the 52) Allawi will likely lose 1-2 seats and SLA gain 1-2 as explained in the other articles and SLA will be the biggest bloc. That’s why they are different from the 52+9 (which referred to people with personal votes less than the electoral divider and hence had less of an impact on seat distribution) and is also why I am making such a fuss about them. This is fast turning into a big joke. Thanks for the link, Safwan! Those are really important points. I share the view that once candidates had appeared on the ballot, one should not take away their votes from the list even if they themselves may be personally penalised by losing seats. I think the whole problem started when the accountability and justice committee were given the right to drive the process forward, starting with their attempt to disqualify entire lists on the basis of the exclusion of a list leader ( https://gulfanalysis.wordpress.com/2010/02/09/chalabi-and-lami-also-control-the-independent-elections-commission/ ) and later introducing the idea of withdrawing votes from lists. Of course, under more normal circumstances, they should just have passively supplied whatever information IHEC demanded and then revert to its normal day-to-day business related to the AJ legislation from January 2008. I find Safwan’s link very interesting and am thinking of what is the common aspect between the recent de-baathifications, kutla definition and annulment of votes that makes them particularly dangerous. Now I think this aspect is the retroactive nature, Safwan’s timing criticism notwithstanding. These acts relate to the votes or candidature of an election which happened before the decisions, all of them could stand for next elections but should not apply retroactively to past elections. If there is a single strategy for protecting the political process in the future then it should be no decisions with retroactive validity. Yes, it stands to reason that Maliki and elements of Dawa supported the open list and also supported the ban on religious endorsement/advertising. Also stands to reason that Sistani would have supported both propositions. There must be a v interesting backroom tussle going on, but Maliki has the advantage of incumbency. He has the choice of doing nothing except ensure that his opponents across the spectrum keep arguing interminably between themselves. First they have to agree to who is going to be president, let alone the makeup of the governing coalition. Meanwhile Maliki just rolls on as PM. Hi Reidar, have yo heard, does this mean that the president will call the next parliament within the next 15 days, or in typical IRaqi fashion, it will find an excuse to delay that? Ali, what they did last time was to call a meeting (eventually, I think in mid-March 2006) and then call it an “open session” (lasting for weeks) before they decided on a speaker and presidential power (in that case the council) more than one month later, towards the end of April if I remember correctly. There is basically no argument about who is going to be president. All the major parties have endorsed Talabani. And it’s far from assured that Maliki will get to return to power. In fact, I’ve been arguing all along that they will push him out. I just published a story today about the problems he’s having with the National Alliance. Thanks. Didn’t realise Talabani was home and hosed. Well then no doubt it’ll be up to the Kurds to decide who is going to be prime minister, just like last time. Well there are a couple of more variables in there. Like the speaker, which is far more important than the president in the next cycle (and which is why few others, except perhaps Hashemi, have bothered to voice an interest in the job), and which has to be agreed before the president can be elected and the process gets going. Interestingly, it seems the major opposition to Talabani comes from Goran! I would have thought that the agreement on who was going to be president would be intrinsic to the agreement on who was going to be the governing coalition.